The Piegan Blackfeet, Pikuni in Blackfoot, are a tribe of Native Americans, many of whom currently live in the Blackfeet Nation, in northwestern Montana with population centered in Browning. Several closely related tribes, the Kainah (Blood), Northern Peigan and Siksiki (Northern Blackfoot), live in Alberta, Canada and are sometimes also collectively referred to as Blackfoot. Ethnographic literature most commonly uses Blackfoot people, and most Blackfoot people use the singular Blackfoot, though the US and tribal governments officially use Blackfeet as in Blackfeet Indian Reservation and Blackfeet Nation as seen on official tribe website. The term Siksika, derived from Siksikaikwan - "a Blackfoot person" - may be used, as may, in English, "I am Blackfoot" or "I am a member of the Blackfeet tribe." Blackfoot Confederacy is a name applied to four Native American tribes in the Northwestern Plains. From the relations of the Blackfoot language to others in the Algonquian language family indicate that they lived in an area west of the Great Lakes. Though they practiced some agriculture, they were partly nomadic. They moved westward partially because of the introduction of horses and guns and became a part of the Plains Indians culture in the early 1800's. In 1900, there were an estimated 20,000 Blackfoot, while today there are approximately 25,000, and the population was at times dramatically lower as the Blackfeet suffered disease, starvation, and war. They held large portions of Alberta and Montana, though today the Blackfeet Reservation is the size of Delaware and the three reservations in Alberta have a much smaller area. The Blackfoot language is also agglutinative. The Blackfoot do not have well documented male Two-Spirits, but they do have "manly-hearted women" (Lewis, 1941) who act in much of the social roles of men, including willingness to sing alone, usually considered "immodest", and using a men's singing style. (Nettl, 1989). The Blackfoot confederacy consists of the North Peigan (Aapatohsipiikanii), the South Peigan (Aamsskaapipiikanii), the Blood (Kainah), and the Siksika tribe ("Blackfoot") or more correctly Siksikawa ("Blackfoot people"). Three of the four are located in Alberta, Canada while one, the South Peigan, is located in Montana. All together they traditionally called themselves the Niitsitapii (the "Real People"). These groups shared a common language and culture, had treaties of mutual defense, and freely intermarried. The Blackfoot were fiercely independent and very successful warriors whose territory stretched from the North Saskatchewan River along what is now Edmonton Alberta, Canada, to the Missouri River of Montana, and from the Rocky Mountains and along the Saskatchewan river and down into the state of Montana to the Missouri river. The basic social unit of the Blackfoot, above the family, was the band, varying from about 10 to 30 lodges, about 80 to 240 people. This size group was large enough to defend against attack and to undertake small communal hunts, but small enough for flexibility. Each band consisted of a respected leader, possibly his brothers and parents, and others who need not be related. Since the band was defined by place of residence, rather than by kinship, a person was free to leave one band and join another, which tended to ameliorate leadership disputes. As well, should a band fall upon hard times, its members could split-up and join other bands. in practice, bands were constantly forming and breaking-up. The system maximized flexibility and was an ideal organization for a hunting people on the Northwestern Plains. During the summer the people assembled for tribal gatherings. In these large assemblies, warrior societies played an important role. Membership into these societies was based on brave acts and deeds. Blackfoot people were nomadic, following the buffalo herds. Survival required their being in the proper place at the proper time. For almost half the year in the long northern winter, the Blackfoot people lived in their winter camps along a wooded river valley perhaps a day's march apart, not moving camp unless food for the people and horses or firewood became depleted. Where there was adequate wood and game resources, some bands might camp together. During this part of the year, buffalo wintered in wooded areas where they were partially sheltered from storms and snow, which hampered their movements, making them easier prey. .In mid-summer, when the Saskatoon berries ripened, the people regrouped for their major tribal ceremony, the Sun Dance. This was the only time of year when the entire tribe would assemble, and served the social purpose of reinforcing the bonds between the various groups, and reidentifying the individuals with the tribe. Communal buffalo hunts provided food and offerings of the bulls' tongues (a delicacy) for the ceremonies. After the Sun Dance, the people again separated to follow the buffalo. n the fall, the people would gradually shift to their wintering areas and prepare the buffalo jumps and pounds. Several groups of people might join together at particularly good sites, such as Head-Smashed-In Buffalo Jump. As the buffalo were naturally driven into the area by the gradual late summer drying off of the open grasslands, the Blackfoot would carry out great communal buffalo kills, and prepare dry meat and pemmican to last them through winter, and other times when hunting was poor. At the end of the fall, the Blackfoot would move to their winter camps. The Blackfoot maintained this traditional way of life based on hunting bison, until the near extinction of the bison by 1881 forced them to change and finally adapt to the coming of Europeans. In 1877, the Canadian Blackfoot signed Treaty 7 and settled on reserves in southern Alberta, beginning a period of great struggle and economic hardship, trying to adapt to a completely new way of life as well as exposure to many diseases they had not previously encountered. Eventually, they established a viable economy based on farming, ranching, and light industry, and their population has increased to about 12,000. With their new economic stability, the Blackfoot have been free to adapt their culture and traditions to their new circumstances, renewing their connection to their ancient roots. Blackfoot music, the music of the Blackfoot tribes, (best translated in the Blackfoot language as nits’nixki - "I sing", from n’nixksini - "song") is primarily a vocal kind of music, using few instruments (called ninixki‡tsis, derived from the word for song and associated primarily with European-American instruments), only percussion and voice, and few words. By far the most important percussion instruments are drums (istokimatsis), with rattles (auan‡) and bells often being associated with the objects, such as sticks or dancers legs, they are attached to rather than as instruments of their own. The basic musical unit is the song, and musicians, people who sing and drum, are called singers or drummers with both words being equivalent and referring to both activities (p.49). Women, though increasingly equal participants, are not called singers or drummers and it is considered somewhat inappropriate for women to sing loudly or alone. P‡skani - "dance" or "ceremony" - often implicitly includes music and is often applied to ceremonies with little dancing and much singing. Blackfoot music is an "emblem of the heroic and the difficult in Blackfoot life." This is evidenced by: "the separation of music from the rest of life through aspects of performance practice, a sharp distinction between singing and speaking, the absence of words in many songs, and the use of song texts to impart major points in myth in a condensed and concentrated form all relate music to the heroic aspect of life. There is a close association of music to warfare and the fact that most singing was done by men and the musical role, even today, of community leaders and principal carriers of tradition. The acquisition of songs as associated with difficult feats--learned in visions brought about through self-denial and torture, required to be learned quickly, sung with the expenditure of great energy, sung in a difficult vocal style--all of this puts songs in the category of the heroic and the difficult." The Buffalo Dance - One of the primary sources of food and other needs was the American Bison. The typical hunting method was drive a herd off a cliff and butcher them after they died at the bottom of the cliff. Similar methods were used in ancient Europe.The night before, the shaman ceremonially smokes tobacco and prays to the sun. His wives are not allowed to leave their home, nor even look outside, until he returns; they were to pray to the sun and continually burn sweet grass. Fasting and dressed in a bison headdress, the shaman led a group of people at the head of a V formation. He attracted the herd's attention and brought them near the cliff; they were then scared by other men hiding behind them, who waved their robes and shouted. The bison ran off the cliff and died at the rocks below. According to legend, at one point the bison refused to go over the cliff. A woman walking underneath the cliff saw a herd right on the edge and pledged to marry one which jumped down. One did so and survived, turning into many dead buffalo at the bottom of the cliff. The woman's people ate the meat and the young woman left with the buffalo. Her father went in search of her. When he stopped to rest, he told a magpie to search for his daughter and tell her where he was. The magpie found the woman and told her where her father was located. The woman met her father but refused to go home, frightened that the bison would kill her and her father; she said to wait until they were all asleep and would not miss her for some time. When she returned to the bison, her husband smelled another person and, gathering his herd, found the father and trampled him to death. The woman cried and her husband said that if she could bring her father back to life, they could both return to their tribe. The woman asked the magpie to find a piece of her father's body; he found a piece of his spine. The woman covered the bone with her robe and sang a song. She was successful and her father was reincarnated. Impressed, the woman's husband taught them a dance which would attract the bison and ensure success in the hunt and which would restore the dead bison to life, just as the woman had restored her father to life. The father and daughter returned to their tribe and taught a small group of men, eventually known as I-kun-uh'-kah-tsi ("all compatriots"), the dances. The Blackfoot also dance the Grass Dance, which they absorbed from the Assiniboin in the 1890s. In Blackfoot mythology there is also a supernatural world, dominated above the natural world by the sun, and below by the beaver. The sun is sometimes personified by the part human Napi, or Old Man. The area in which the Blackfoot lived was created by Old Man exploring the area on his way north. The numbers four, the cardinal directs, and seven, the six principle points and center, are important in Blackfoot mythology. 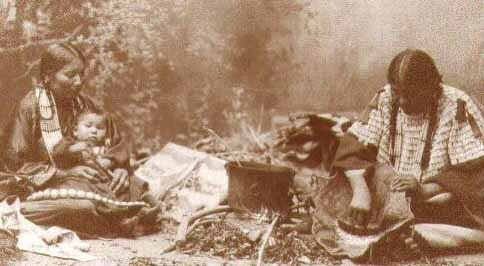 Communication occurs between the supernatural world and Blackfoot through visions of guardian spirits, during which useful songs and ceremonies may be imparted, such as that of medicine bundles. Ceremonies include the Sun Dance, called Medicine Lodge by the Blackfoot in English.